However, there is a variety of other reasons why the USA is famous. The following paragraphs are providing you with the relevant information to show you how people live in the states, what is special about the US and which cultural traits are worth looking at. The size of the United States’ land is enormously huge because it ranges from the east of North America to the West. Thus, the total land area is of 9,826,675 km2 and right after Russia, Canada and China it is the fourth biggest country by land area. It consists of 50 states, 16 territories, a federal district, 310 Indian reservations and various overseas extraterritorial jurisdictions. States like Alaska, Texas, California, Montana and New Mexico are blessed with the largest landmasses. However, the most popular states in the US to pursue studies are New York, California and Texas. The largest cities however are scattered around the country and have been the backdrop for many movies or served as worthwhile study destinations. Those include New York City, Los Angeles, Chicago, Dallas, Houston and many more. The weather in the states is due to its humongous size very diverse. There might be Florida, California, Arizona or Nevada, which are all located in the south recording high temperatures every single year. States located in the north however like Montana, Wyoming and especially Alaska are basically cold. Hence, Christmas and other statutory holidays are celebrated very differently. It might snow in New York City and you can imagine Christmas with a typical backdrop of snow. It is very unlikely though that you find the same conditions in Florida - warm temperatures are common within this period. Wherever you stay during your studies or your visit, make sure you find out about the weather of your destination. It can vary a lot. The United States’ population totals up to more than 316 million and is famous for its cultural and racial diversity. Due to its history, people from around the world immigrated to the country in the North of America. Because the first waves of immigrants came from Europe, the stake of white people in the population is nowadays 72.40%. Black Americans follow closely with a stake of 12.60%. 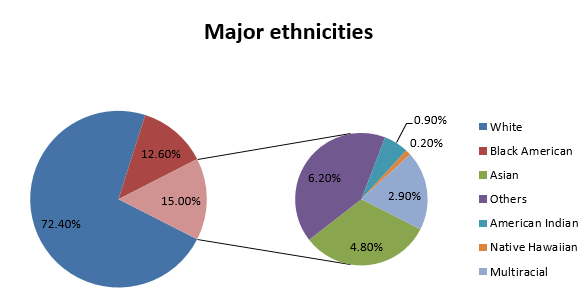 The remainder comprise of Asians, American Indians, Native Hawaiians, Multiracials and plenty of others. Regarding language it can be stated that most of the US’ citizens speak English. The exact amount is 80.38% or 233,780,338. Other languages account for 19.62% with Spanish the second most spoken language, which is spoken by 12% of the population. The remainder is divided equally among Chinese (Mandarin and Cantonese), Tagalog, Vietnamese, French, Korean, German, Russian, Arabic, Italian, Portuguese, Polish, Hindi, Urdu and plenty of others. Plenty of religions can be found in the US. However, it can be stated that Christianity is the no.1 religion in the US which is followed by approximately 75% of the population. Interestingly, 16.1% of the population don’t follow any religion. 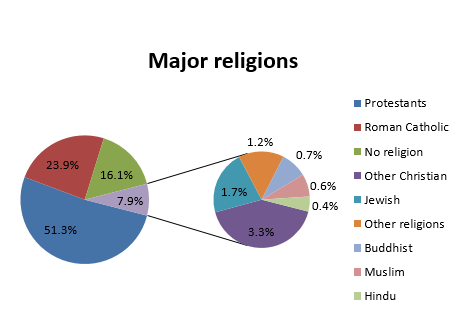 Jewish, other Christians, Buddhists, Muslims, Hindus and other are further faiths. In case you have the chance to stay longer in the states you will be able to enjoy one of those days. There are plenty of places to visit that are going to be discussed in the following chapters. Miami Beach's night scene has always been hopping and the chic South Beach neighbourhood leads the party pack. You'll find everything from plush lounges to deafening dance clubs lining its art-deco streets. Las Vegas has earned its reputation as a giant playground for adults for good reason. Some of the world's most riotous nightclubs reside in the city's palatial casinos. No city has a wider variety of nightlife options than NYC. There are a million ways to spend an evening, whether it's sipping cocktails in a trendy SoHo lounge, participating in a never-ending bar crawl in the East Village or belting out karaoke with your friends. When the sun goes down, Chi-town hot spots crank up the nightlife with live music, theatrical performances and dance beats. But while the Windy City boasts a fair number of swanky lounges and booming nightclubs, most locals prefer a more laid-back night out at a neighbourhood bar.